cool pic made with logomakr.com! Summer’s in full swing and we’re relaxing on the back porch with a nice cool glass of Sangria! Ooooh ya, pour me some of that! 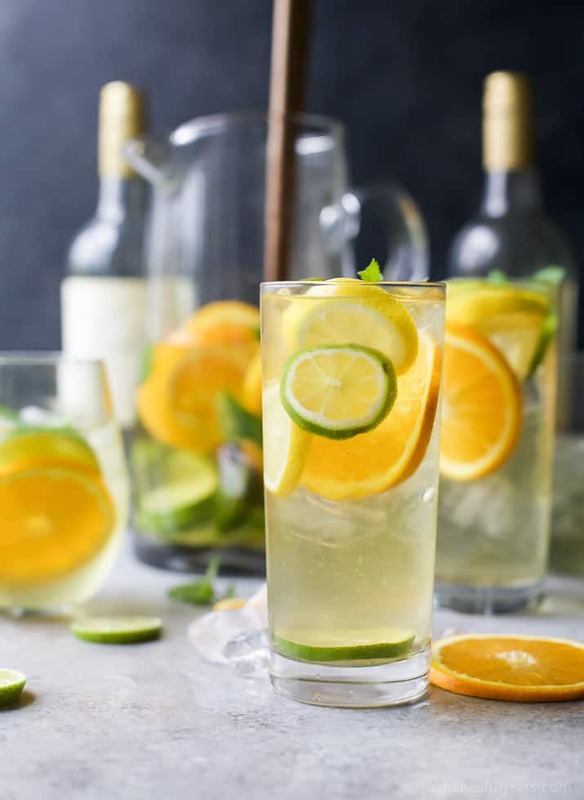 Traditionally an iced wine beverage made from red wine and fruit, sangria derives its name from the Spanish word for blood (sangre) – now don’t be too grossed out, let’s think blood oranges, yes? And the color of blood, like red wine, is, well, RED. SO, Sangria – a super refreshing and full-bodied bowl of tipsy fruit in a glass. YUM. Let’s make some! 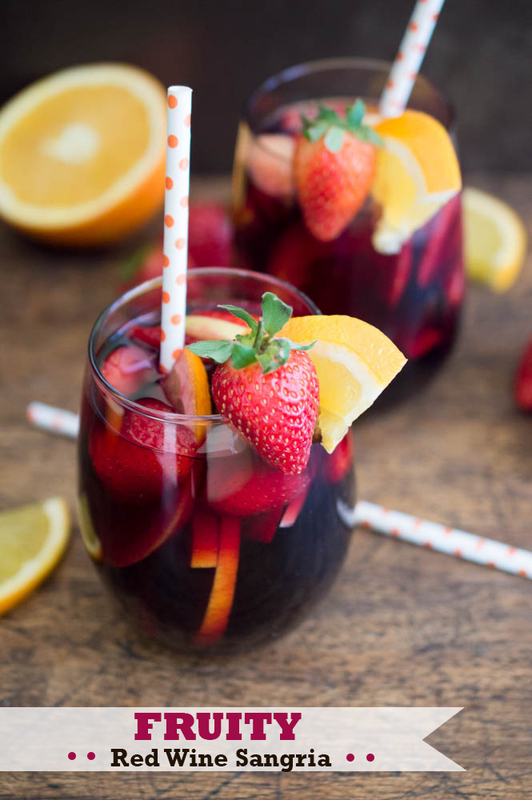 10 Summer Fun Sangria Recipes! All the traditional ingredients you’d find in a deep red glass of sangria! Plus, we know that red wine already packs in a host of superhero antioxidants, well so does pomegranate juice which stars in this recipe too! So KAPOW! We should re-name this one the SUPERHERO Sangria! This one just tickles my fancy because it’s so darn PRETTY! Invite the gals over and delight them with this pretty in pink drink. 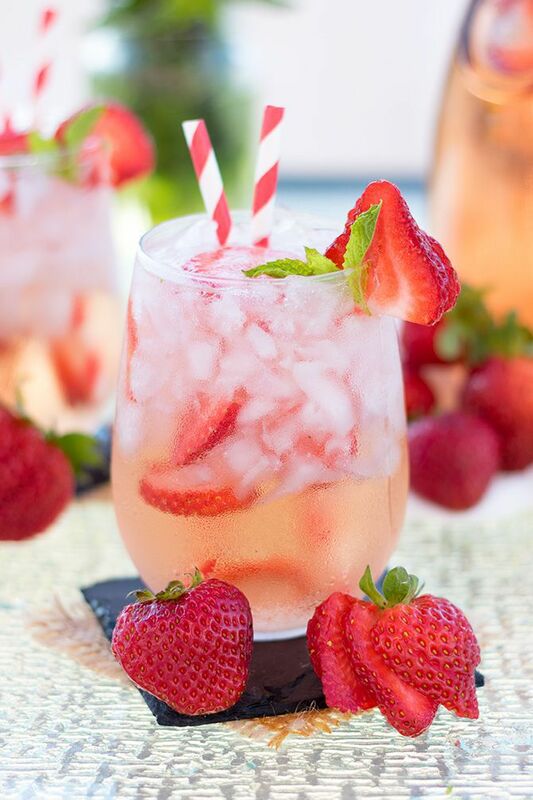 Sweet strawberries mixed with a dry rosé is a winning combination, don’t you think? It’ll have you singing Strawberry Sangrias Forever…. In a large pitcher, combine wine, vodka, and 1/2 of the strawberries. Taste for sweetness and add sweetener if necessary, and stir. Just before serving, add Sprite, the rest of strawberries and gently stir. 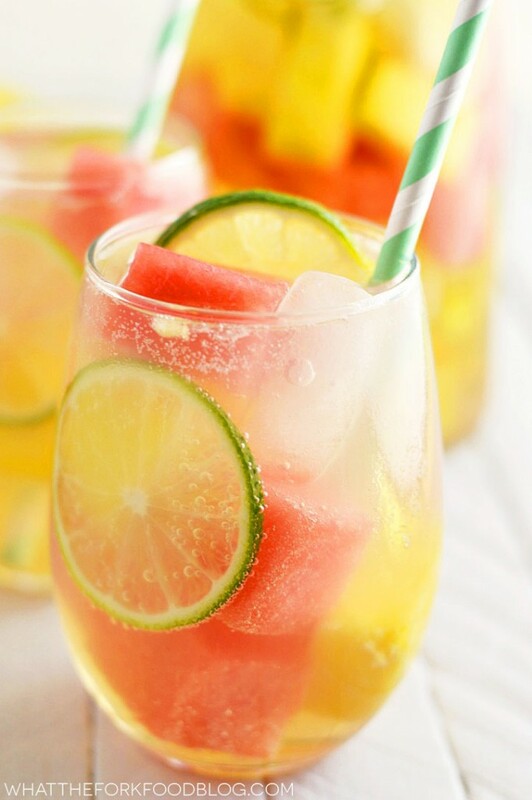 Sangria + Watermelon = Summer served in a glass! 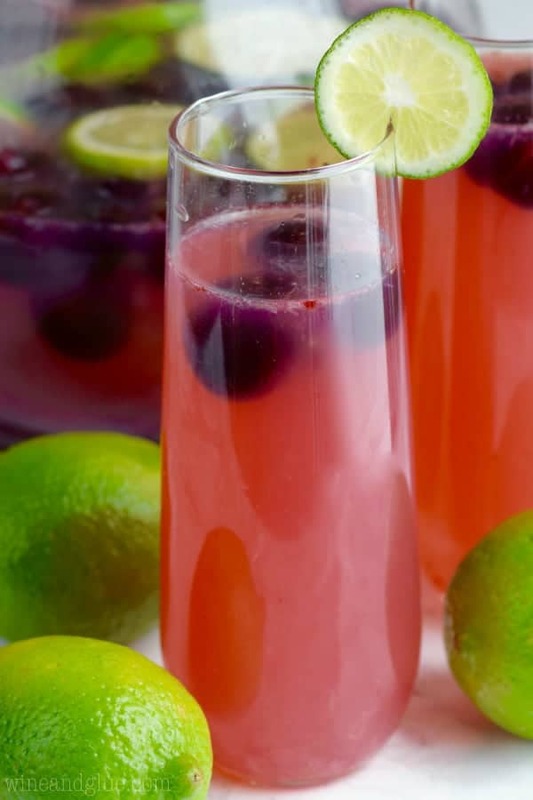 This recipe screams REFRESHING!! I picture myself sipping on a glass of watermelon sangria after having a nice summer swim, in somebody’s awesome backyard pool. And then we’d have a BBQ. And more watermelon sangria. You with me? 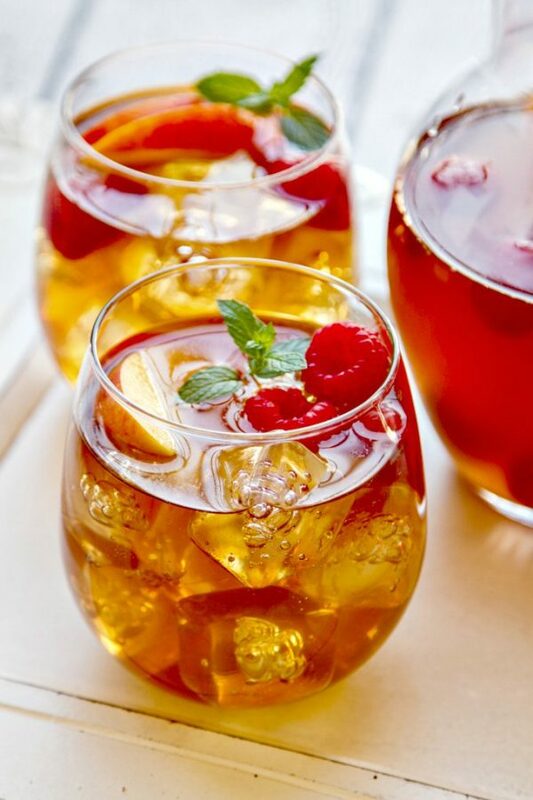 A bottle of Moscato and ½ cup of brandy has us thinking outside the Sangria box! Here’s a modern twist on this classic drink! Cool cucumbers, juicy sweet honeydew, and a hint of fresh mint in a dry white wine take your taste buds to zen mode. Pull up a lounge chair, place 2 slices of cucumbers on each eyelid and chill out with this hip sangria version. An adult lemonade, please! Lemons, Limes and Oranges, OH MY! White wine and vodka too! Mix it all up with some agave nectar and some mint sprigs and oh WOW, you have a spiked citrus orchard party in your mouth! Add all the ingredients to a large pitcher. Or for BEST results. Cover and let rest in refrigerator for 4 hours. Then serve over ice! Apple fanatic? Oh you’re going to go bananas…or apples, over this one! 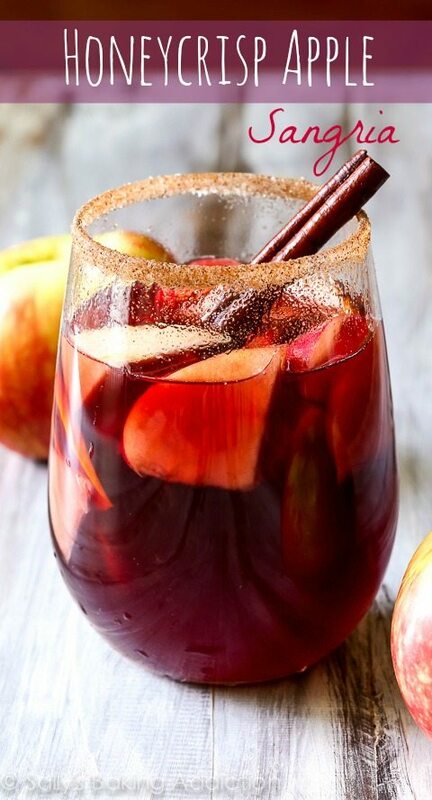 Cinnamon, spice and everything nice (red wine) = Fall Time Sangria! Can’t you taste it now? I can smell it! The warm spicy cinnamon and the sweet crispness of apple mixed with a lovely Spanish red wine…pure Autumn Sangria Heaven! tor for 6 – 24 hours. Taste; if you’d like it to be sweeter, add 1-2 Tablespoons granulated sugar, honey, or agave. There’s something reminiscent about my childhood when I hear Cherry + Limeade… I’m picturing that little box of pure crunchy sugar – NERDS! poured out into my little kid hand. Or FUN DIP! Loved that you could eat the stick too, how resourceful! Cherry Limeade is definitely a fun and delightful flavor! It’s really important for this wine to not pick a sweet white wine like a Riesling or a Moscato. If you do, the sangria will be way too sweet. If you don’t like dry white wines typically, give this recipe a try! The sweetness from the limeade really makes it a sweet drink. 8. Y’all! It’s a Southern Sweet Tea Sangria! Tea? In Sangria? Sure, why not?! Southerners might be disgusted or delighted by the thought who knows? I’m Canadian…beer sangria anyone? Sorry, I digress. Sweet Tea! Yes! Mixed with Georgia peaches and razzling raspberries of course! Put it all together with some white wine of your choice, and Bless Your Heart! !, you have there a Sweet n’ Southern Sangria, y’all! I feel like if you can walk out your door and randomly find blackberry bushes, you must live in the country. If you can also randomly find a peach tree you’re just damn lucky. 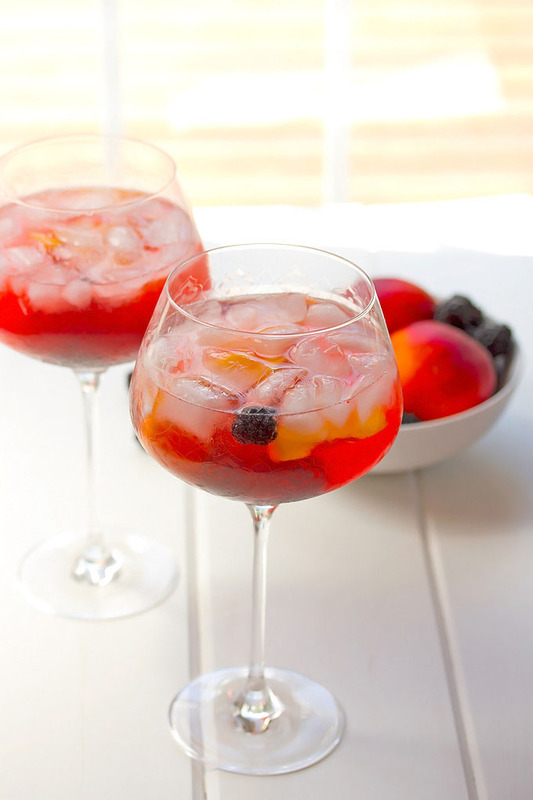 So grab your pail of berries and your bushel of peaches, or in this case, a bottle of peach schnapps, and make this sangria! First make the simply syrup. Put all the ingredients into a medium pot and bring to a boil. Turn the heat down to medium and simmer for at least an hour or until the mixture reduces and starts to thicken up a bit. It doesn’t need to be too thick. Set aside to cool. Top it off with a little club soda. You don’t have to do this, but otherwise we feel like it is too sweet and just a little club soda tastes great. If you can drink OJ and champagne in the morning, I think this sangria recipe is allowed too. Instead of your big bowl of half a grapefruit in the morning, why not have it in a glass? And a little spiked? Yes, please! In a small pitcher, mix all ingredients except for ice and mix to combine. Pour over tall glasses filled with ice and garnish with orange and grapefruit wedges.